Clearco Fasteners is a company that likes to make their customers happy and satisfied. We offer different types and styles of packaging containers ranging from 100 pcs to bulk boxes. We offer brand name products or we will consider private label options for companies that like to use their own brand names. Click each pic for a slideshow. We offer sourcing and designing services for new products. We have access to both domestic and imported products. We will stock your products and use J.I.T. programs to help with inventory control and flow. Bring your ideas to us - we will help. Here at ClearCo Fasteners, we manufacture and distribute a full line of cable ties, tools, and accessories including mounts, sleeves, wraps, looms, clamps, and mounting pads. All of our nylon cable ties and accessories are sealed in bags of 50 or 100 depending on size. Then they are packaged in durable boxes ranging from 500 to 10,000 pcs. They can be purchase in single bags, box, or pallet quantities. Here at ClearCo Fasteners, we manufacture and distribute a full line of fasteners and screws. Each comes in a variety of head types, sizes and lengths for a variety of surface types and applications. 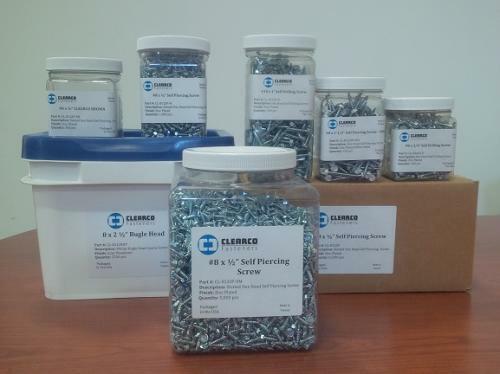 Clearco Fasteners packages screws and fasteners into clear plastic containers with white plastic screw on lids. Container quantities range from 250 pcs to 5000 pcs. Generally they are packed 16 per box. For the best possible price range Clearco Fasteners offers fasteners in bulk boxes known as ¼ kegs. 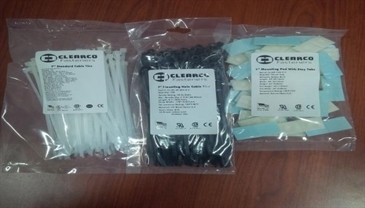 Here at ClearCo Fasteners, we manufacture and distribute a full line of standard and custom wire forms including but not limited to sod staples, "S" hooks, wire rings, straightened wire, and custom wire products. 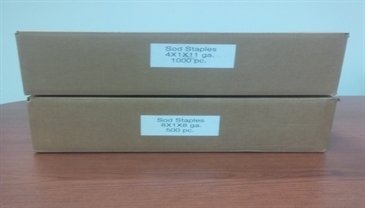 All of our non-custom wire products are packaged in durable boxes ranging from 150 to 1,000 pcs.